What you write in your email messages is the most important thing. But you might be surprised how much your font style and size matters as well. It's important to select a font that is clean, uncluttered, and easy to read. You don't need to settle for the default font in your email program. But at the same time, you'll want to stay away from novelty fonts — such as ones that look like handwriting — which can make your email appear unprofessional. Using the right font is an unobtrusive choice that can help your message get through. Get tips to help you make the right choices. Make your font large enough so that the reader doesn't have to squint to read the message, but not so large that the reader has to scroll too far to read the entire message. Depending on how long your text is, a 10-point or 12-point font size is optimal. Yes, the recipient can change the font size in the email, but you shouldn't force them to do that. Stick to the classics. Familiar fonts like Arial, Verdana, Calibri, and Times New Roman all work well. You may find that your program uses one of these as the default font. If not, they will be among the choices available in the program. Remember that different email programs have different displays, and an unusual font that works well in your program may be tough to read or even strangely formatted in another program. Avoid fancy fonts that look like handwriting or script fonts, and any novelty font such as Comic Sans. You may find it attractive but the recipient may find it hideous, unreadable, or both. No matter which font you choose, be consistent throughout the message in both style and size. Switching between Arial and Times New Roman, or among type sizes, is jarring for readers. After you create a new message, select the font style and font size you want from the options available in the program. Font style and font size will be displayed among other options in a strip of clickable icons at the top or bottom of the message box. Click on the font style icon, and then click on your choice on the list that pops up. Then do the same for the font size. Create the message and enter your text. Then highlight the entire text, and click on your selections for font style and font size. There are plenty of other options in that strip of icons, and for the purposes of business email, you probably want to ignore them all. Italicized text and boldface text are unnecessary flourishes in business communications. Playing with background colors or text colors will make you look like you have too much time on your hands. Here's how to space your email message. Once you find a font style and size that you think looks good, proofread it. Then send a copy to yourself and proofread it again. Once you're sure you've made the right selections, you can start using your new email font. Although in general you want to use one font consistently throughout your email, it is acceptable to have your signature appear in a different font style and size. Often, signatures include the person's name in a larger font size, and potentially bolded as well. 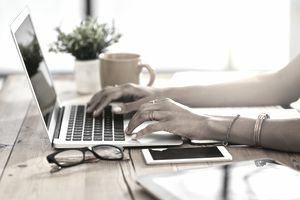 Get more advice on how to set up a professional email signature, including what to include in your signature — and what to leave off.